Non-alcoholic fatty liver (NAFLD) is a condition where fat builds up in the cells of your liver. It’s sometimes referred to simply as fatty liver disease. Unlike alcohol-related liver disease, it isn’t caused by drinking too much alcohol. NAFLD is the most common type of liver disease in developed countries. The average age of people who get it is between 40 and 50. Yet children and teenagers are developing NAFLD more now than ever before. In most people, if NAFLD is mild, it doesn’t cause any serious liver-related health problems. But it can sometimes damage your liver if it’s severe. If your liver is healthy, there should be little, or no, fat in it. But sometimes, for a variety of reasons, fat can begin to collect in your liver cells. If the build-up of fat isn’t caused by drinking too much alcohol, it’s called NAFLD. There are different stages or levels of NAFLD. Fatty liver (steatosis). 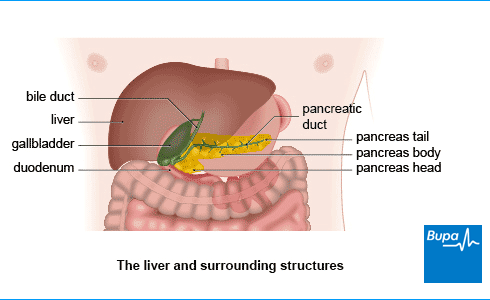 This is when fat builds up in the cells of your liver. Non-alcoholic steatoheapatitis (NASH). This is when the build-up of fat causes your liver to become inflamed and some of the cells to die. Fibrosis and cirrhosis. This is when damage to your liver is replaced by fibrous scar tissue. When the scarring is at its worse, this is known as cirrhosis. In cirrhosis, the liver is covered in lumps of scar tissue. The damage is thought to be irreversible and can lead to liver failure. If you have NAFLD, making changes to your lifestyle including your diet and exercising more may help to prevent or reverse damage to your liver. See our treatment sections for more information. NAFLD often has no symptoms in the early stages. You may only find out you have it if it’s found in a test you’re having for something else. It might come to your GP’s attention that you have a problem with your liver if you have an ultrasound of your tummy (abdomen), for example. This might be in a routine medical test, or a test for another health condition. Your GP will then ask if you have any symptoms, and examine you. They’ll also ask you about your medical history and your lifestyle, and may weigh you to see what your body mass index (BMI) is. It’s important to be honest about your lifestyle and how much, and how often, you drink alcohol. This will help your GP to make the right diagnosis of the type of fatty liver disease you may have. If your GP suspects you have liver damage, they may refer you to see a hepatologist (a doctor who specialises in conditions of the liver). You’ll need to have a blood test to check how well your liver is working and to check your blood cell count. But blood tests alone aren’t always that reliable. Some people have liver damage despite having normal blood tests. So you may also need to have an ultrasound to create images of your liver to see if there’s any fat in it. You might then need to have a computer tomography (CT) scan or magnetic resonance imaging (MRI) scan afterwards to create more images. You may also need to have one or more of the following tests. Transient elastography (Fibroscan). This is a test that measures the stiffness of your liver to see if there is any scarring in it. Rather than diagnose fatty liver, this is used to see if you have severe liver damage. Some transient elastography machines can measure how much fat is in your liver; so can diagnose fatty liver. A liver biopsy. In this test, your doctor will insert a very fine, hollow needle into your liver under local anaesthetic to collect a small sample of tissue. They’ll send this to a laboratory to be tested. Biopsies are used far less now as there are easier ways, such as transient elastography, to test for liver damage. There aren’t any specific treatments for NAFLD, but you can take steps to address anything that may be causing it. One major thing you can do is to make some changes to your lifestyle to prevent your condition getting worse. See our Self-help section below for details. It’s important to make changes to your lifestyle to reduce the amount of fat in your liver. You’ll need to improve your diet, lose weight if you’re overweight and exercise more. Studies have shown that exercise reduces liver fat content. If you’re planning to lose weight, make sure you do it safely. For more information, see our topic: Losing weight safely. We also have information on: How to get started with exercise. There aren't any medicines to treat NAFLD, but there are various medicines that are useful in managing problems associated with it. For example, medicines to treat high blood pressure, treat high cholesterol, and type 2 diabetes. If you drink alcohol, it’s important to stay within the national recommended limits for alcohol consumption. See our topic on Sensible drinking to find out more. There’s also information in our FAQ: Alcohol and non-alcoholic fatty liver disease below. You might decide it’s a good idea to stop drinking completely – ask your doctor if you want to talk about this more. If you have NAFLD, your GP will monitor your condition from time to time (every year to three years depending on how severe it is). They might refer you to see a specialist for further assessment. This can show them (and you) if making changes to your lifestyle is working, and to make sure your liver doesn’t get any worse. Your GP will examine you and may do some tests, such as take your blood pressure and measure your body mass index (BMI). You might need to have some blood tests too. You may be offered a blood test called an enhanced liver fibrosis (ELF) test every three years to see if your liver has become scarred. Or your doctor might suggest you have transient elastography instead. If you stick with the changes you make to your lifestyle, your liver may recover. If you don’t make any changes, fatty liver may progress into more serious liver disease and damage. Non-alcoholic fatty liver disease is caused by a build-up of fat in your liver. There are many different reasons for this, but unlike alcohol-related liver disease it isn’t caused by drinking too much alcohol. There are several different stages of NAFLD. In some people, the build-up of fat causes inflammation and scarring, which can lead to serious liver disease. This can also increase your risk of getting liver cancer. If you have NAFLD and type 2 diabetes, you may also be more at risk of cardiovascular disease. Your doctor will check if anything else is also putting you at risk, and help you take steps to reduce it. For example, they’ll check your blood pressure and cholesterol levels to see if these are within the normal range. You might need to take medicines to control these. Can I still drink alcohol? Can I still drink alcohol? Alcohol is processed by your liver so if you have liver problems, it can be dangerous to drink. Even if you have liver disease that isn’t caused by drinking too much alcohol, drinking can still make it worse. This is because alcohol can increase the amount of fat in your liver. It’s difficult for doctors to be precise about how much is safe for you to drink. Current government guidelines recommend both men and women don’t regularly drink more than 14 units over a week. It’s a good idea to have several alcohol-free days to give you (and your liver) a break from drinking. But this doesn’t mean you can save up for a weekend binge. For more information on how many units are in drinks and tips on how to drink responsibly, see our information about Sensible drinking. Should I be worried about abnormal blood test results? Should I be worried about abnormal blood test results? Abnormal blood tests (or liver function tests) aren’t uncommon and don’t always mean you have a serious liver condition. Liver function tests involve taking a sample of your blood and carrying out different tests on it in a laboratory. Liver function tests can help show whether your liver is inflamed or damaged, and if it’s working properly. Getting an abnormal liver function test result isn’t uncommon and doesn’t necessarily mean that you have a serious liver problem. Some of the tests aren’t very specific and an abnormal test can be caused by other conditions, not just liver disease. The results can also change over time so your doctor may need to do the test again and may well get a different result. Your doctor will use further blood test results and sometimes a scan of your liver to find out if there is anything abnormal with your liver. What should I eat if I've been diagnosed? What should I eat if I've been diagnosed? It’s a good idea to take steps to lower the number of calories you eat so you don’t get overweight. If you’re already overweight or obese, it’s important to try and lose weight. But don’t crash diet – it’s best to lose weight gradually. If you lose weight too quickly, it can make any inflammation in your liver worse. It’s a good idea to reduce the amount of fat in your diet by eating a balanced, healthy diet that’s low in saturated fat. It might help to eat a low calorie diet too. This is because you’re more likely to develop a fatty liver if you’ve been diagnosed with insulin resistance (where your body does not respond to insulin as it should). Insulin is a hormone that your body produces to work on muscle and fat cells. It helps to control your sugar levels and food and energy balance in your body. If your muscle and fat cells stop responding to insulin (you have insulin resistance), your pancreas releases more. Your liver is then bombarded by insulin, which allows more fat into the liver cell and decreases the amount of fat processed and released from the liver cell. If you eat less sugar and carbohydrates, it may help to offload your liver. Try to eat fewer foods and drinks that contain large amounts of simple sugars, especially fructose. Fructose is found in sweetened soft drinks, sports drinks, and juices. A healthy diet combined with an active lifestyle can help you to lose any excess weight. This should also help to reduce the amount of fat in your liver. See our Related information below for tips and advice on both a healthy diet and exercise.